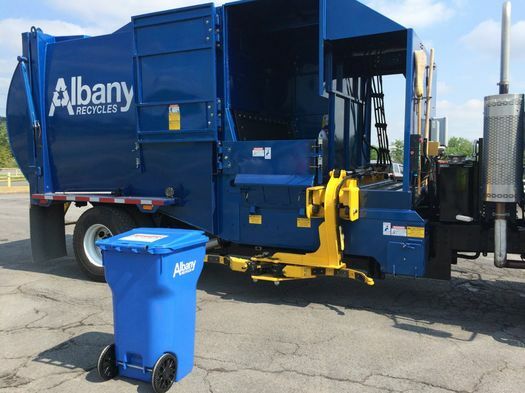 The city of Albany is running a pilot test of a type of truck that's new the city's fleet. The truck has an automated arm that reaches out and grabs 64-gallon recycling bins and then dumps them in the truck -- it doesn't require a human to do the lifting. "One of the focuses of the Department of General Services has been to find efficiencies and more sustainable ways of operating while maintaing services," Dan Mirabile, Albany's commissioner of general services, said this past Friday after a demonstration. "This pilot program we feel is the first step in that direction." 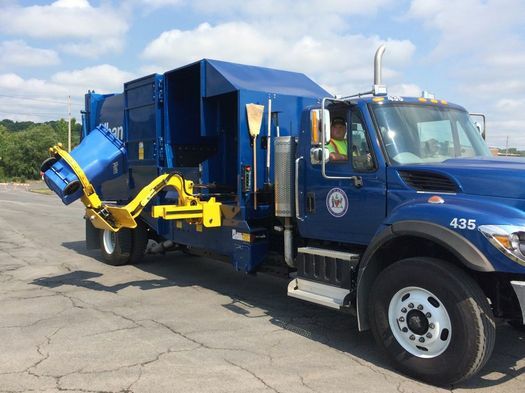 The pilot test is set to run for about eight months, during which the city will be gauging how well the truck works along various types of streets in the city. 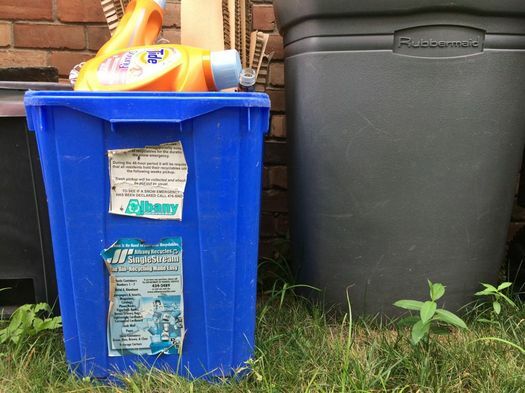 About 2,000 homes will be involved in the pilot and those homes already have new, larger bins. The city administration's hope is that the new truck will allow recyclables to be picked up faster (saving fuel and reducing emissions from idling), provide a safer work environment for truck crews (because workers won't have to lift bins), and save the city money through lower workers compensation payments, overtime, and fuel costs. + The "packer" trucks the city currently uses to pick up recycling have three-person crews. The new truck uses a crew of just one person, the driver. + Current trucks run routes that cover about 900 pickups a day. Mirabile said DGS wants to see if it's possible for the automated truck to do maybe 1,500 pickups in a day. + One of the goals of the pilot is to figure on which streets the automated arm can work. For example: streets with cars parked on both sides probably are a no-go. Mirabile said DGS figures 30-40 percent of the city's streets should be OK for the truck. + The city currently has seven packer trucks for recycling. If this pilot shows the new truck can work on the upper range of that number of streets, the city could add another one to its fleet. Mirabile said the city frequently cycles through trucks as they age out. The typical life of a packer truck is 12-15 years. + The truck costs about $230,000, which Mirabile said is typical for a trash truck. In this case, half of the cost is reimbursable from the state because of a grant from the state Department of Environmental Conservation. + A feature you might not expect about the truck: It collects data. The 64-gallon bins have RFID tags -- basically tiny electronic markers that can be read by a computer -- and the truck can use those tags to collect data about location, how long it takes to make a pickup, and how much is in a bin. Mirabile said the city is hoping to use the data it collects to optimize truck routes and and adjust staffing. "This is the first time the city will have this type of data and it's huge." + This type of truck isn't really that new. Mirabile said other municipalities and haulers in the region are already using them. + Of all the trash collected by the city of Albany and the other members of the partnership that uses the city landfill out on Rapp Road, the amount of stuff that ends up being recycled or composted or otherwise not dumped is 50 percent. (And 10 percent is the sort of stuff you'd drop into a recycling bin -- paper, plastic, cans, etc.) This is figure is known as the "diversion rate." + Frank Zeoli, the director of operations for DGS, said the city and the landfill partnership has a goal to reach a diversion rate of 65 percent by 2021. + The city is hoping that the new, larger bins that the automated truck can pick up will lead to people recycling more. (The experience of other municipalities suggests that can happen.) Said Zeoli this past Friday: "We need to get people to recycle more. People need to understand that trash has gotta go somewhere. So really think about what you're doing. Look at your trash and ask what could go in the recycling." + In addition to old reduce/reuse/recycle mantra, Zeoli added another "r": refuse. He suggested people think about whether an item they're buying can be recycled -- and if it can't, don't buy it. + Among the many reasons for the city to step up recycling: The city landfill will be out of space by the end of 2022 -- with no extensions. The city will then have to contract to send its garbage somewhere else. This is a great start to a greener Albany. However, there needs to be municipal compost pick up in the City of Albany to actually save on space in landfills as well. Food waste in the landfills is especially problematic. The issues is that food in landfills decomposes in the absence of air. This anaerobic process produces methane, which is a powerful greenhouse gas which is harmful to the environment. Composting coupled with recycling is a great way to divert items from being thrown in the landfill. Currently those that are interested compost in their backyards or use the Radix Center, but it is a larger issue that needs to be tackled directly by DGS if they are really concerned about reducing waste in landfills. I have notice new recycling bins in the streets around me. They are trash can style bins with wheels. I am in the helderberg neighborhood but I have noticed them on the other side of new Scotland as well. Frankly,(Zeoli) see what I did there? I am appalled by the lack of recycling on my street. I still do not think my neighbors are educated on the single stream concept and or just do not give a hoot if they pollute. On the subject of methane gas. Many municipalities are trying to harness the gas and use it to produce electricity. Do we know if this is something being done or being looked at? I'm concerned that during the test period there will be no opportunity for participant feedback. because.. well.. this is Albany. For example., do the new larger bins pose problems for residents with physical limitations.. do users have problems accessing and storing new bins, especially in winter? Etc. I'm also interested in placement of bins for pick up. I've always been told don't put bins in street, but these appear to need flat surface. And I'll be darned if I can figure out what happens in snow bank weather. "This is the first time the city will have this type of data and it's huge." Oh, so this data hasn't existed in the past? Then I guess DGS and the Mayor have secret data that shows multi-family buildings are generating excessive trash and should therefore have to pay an annual fee. Steve B, Rapp Road does capture methane for electricity generation. Grr, according to a 2009 report, the solid waste management agency did explore Pay As You Throw (see section 2.6.2). I don't know why we got the fee we got when the alternatives are clearly better. All this wondetful new technology and we still can't recycle a pizza box?? ?